We were first turned on to writer Dale Maharidge and photographer Michael S. Williamson when their phenomenal book Journey to Nowhere: The Saga of the New Underclass inspired Springsteen to write songs for The Ghost of Tom Joad. Springsteen wrote an introduction for a 1996 edition of that book; 15 years later, he's introducing their work again. 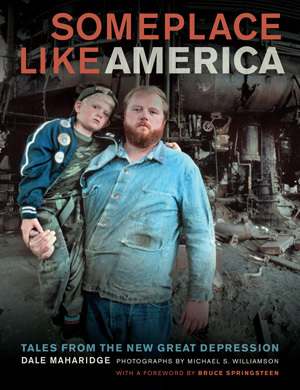 In Someplace Like America, Maharidge and Williamson take us to the working-class heart of America, bringing to life --through shoe leather reporting, memoir, vivid stories, stunning photographs, and thoughtful analysis -- the deepening crises of poverty and homelessness. The story begins in 1980, when the authors joined forces to cover the America being ignored by the mainstream media -- people living on the margins and losing their jobs as a result of deindustrialization. Since then, Maharidge and Williamson have traveled more than half a million miles to investigate the state of the working class (winning a Pulitzer Prize in the process). In Someplace Like America, they follow the lives of several families over the thirty-year span to present an intimate and devastating portrait of workers going jobless. This brilliant and essential study -- begun in the trickle-down Reagan years and culminating with the recent banking catastrophe -- puts a human face on today's grim economic numbers. It also illuminates the courage and resolve with which the next generation faces the future.